This stunning princess cut diamond solitaire ring from The Forever Diamond is set in sleek palladium and finished with a delicate twist setting and features a total diamond weight of 1/3 carat. The Forever Diamond has a unique cut made up of 73 facets for exceptional sparkle and radiance. Each Forever Diamond has been independently certified by IGI for colour, clarity, carat and cut. 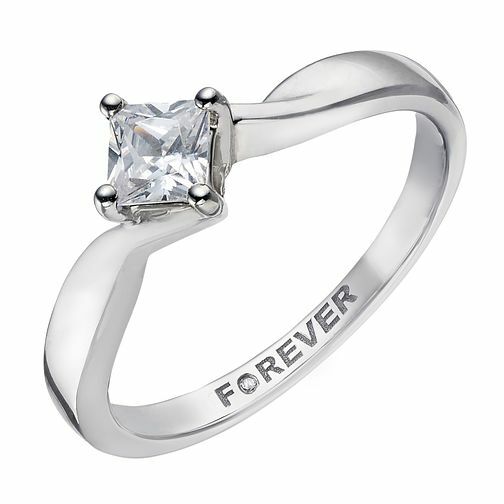 Palladium 1/3 Carat Forever Diamond Ring is rated 5.0 out of 5 by 1. Rated 5 out of 5 by Anonymous from Excellent Ring I've had this ring for nearly a year and still in love with it ever since I got it. Love the style and the quality of this gorgeous ring. pic does not do justice with this ring. I've received number of compliments on this mesmerising diamond.